Hey!! I know I’m late for this review!! So by the chance you won’t read it? Please DON’T! I just wanna share my thought for you all! Overall, I’m kind of little bit disappointed for this album! They did so DAMN PERFECT in their last Japanese album ‘T’ (The best album ever released by them I think)! But I just have some songs to my top rating in this album! My lovely part of this come back is their looking! Hwaaaa….. our cute TVXQ has gone, they back with a GENTLE looking now and it’s so good! Zzzzhhhh…. So nice to see them always like that! 01. WRONG NUMBER – yeah.. Junsu get the first! *My Bling Bling love* I Love the chorus and the translation is so catchy! All the fanatic girls will be knocked by this song! I’m really so fond to the lyric! It’ll be cool if I put it for my ringtone (only for the chorus), especially for the prank number that like to ring on me…LOL! JeJung did the best but it’s not mean that I think his Rap is COOL!! This is the first time I hear he rapped! It is a FORCING rap! So … let’s check the next track! 02. Don’t Cry My Love : It didn’t grow well on my ear previously. JeJung in the first, he sounded so lovely. Then YunHo, I would like to hear more parts of his voice now. I always feel that he has a different voice, he sounds more harsh and well it’s great. 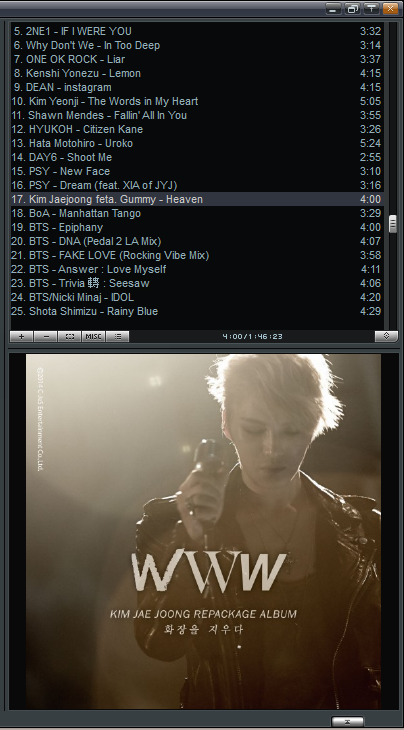 My favourite part is JUNSU’s part of course. Because I love Junsu’s voice. Anyway,TVXQ has many ballad tracks that better than this one. The second verse, I think ChangMin’s part must not available, Junsu sounds so spectaculer before,but then Chang Min sounds his part with a calm voice. It’s not suit. Junsu’s ad-libbing is only the PERFECT part in this song. 03. 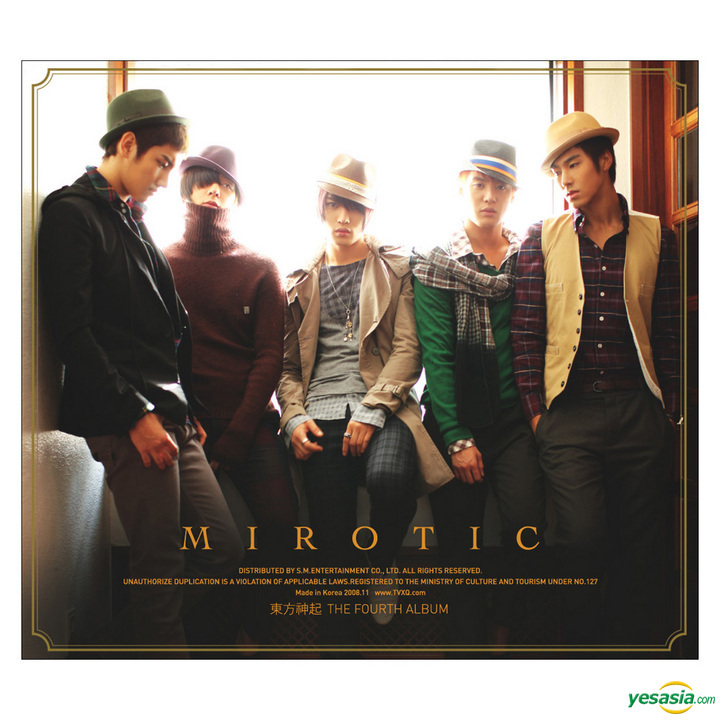 MIROTIC – This song was built by Remee and Thomas Troelsen who also join in BoA’s American debut team! My first impression for this song is MESSY!! I really can’t get into it before. But day by day… I Love this song! Junsu did the best maybe! Yeah… my JUNSU © I love Jejung’s part in the first, his voice is TREMBLING! Haha..LOL! Anyway, Junsu and Max get an error pronounciation! Junsu says “Red Ocean” with it’s going like “Ledu Osion”, and Max says “Chrome Heart” similar like “Geurom Heart”… hahaha so Freaky indeed! Ok! It’s depend on their accent and sometimes they need to pronounced the english line like the korean phrases. If you hear the instrumental, it’s so repetitive! Do you know some rumours tell about MIROTIC is similar to Sarah Corner’s song, especially the beat.. I just hope that it won’t spread over! Does it mean that I spread the rumour from this blog? *Stupid Me* Please over it! Totally this is a great track! 04. CRAZY LOVE – What is the real style of this song?? My rating for it is low! I can’t get used to it. 05. HEY! DON’T BRING ME DOWN – I got 2 versions of this song! It’s not too different! The difference is just the intro (Yoochun’s part). The first version that I get on the album, Yoochun-oppa said “Break it down now Break it down now” but in another song that I get for my FS music layout, Yoochun-oppa said “Give it away Give it away” and the song is shorter! I Love the album version more! Actually this is the best upbeat song over this album. I’m fallin’ for it at the first time! Their dance move for this song is so…………. KNOCK DOWN, especially Jejung-oppa’s scream “Aaauuwww… ! I think this song is better than MIROTIC! Hehe…. 06. Wish : This is one of the best track from the new added songs. I just heard Junsu dominated the song and Chang Min followed. Hahaha… it’s never mind. Hey…. this is not whole of DBSK. I heard some different voices such as Kyu Hyun and Ryeowook. Haahh… I think I’m right! Nice combo^^. 07. YOU ARE MY MELODY – I forget the Korean title! This is a relaxed song, I’m not so over to this song before. But for some reasons this song is kinda reminds me for…. Something that I can’t describe. It’s really good to hear it within the sunny day. And for their voice harmonization, I just listen Junsu’s pronounciation “IT’S YOUR LOVE YOUR LOVE” … hakhakhak.. *laugh* what’s wrong to his accent! 09. MUJIGAE [Rainbow] – It catch an acid jazz! A light song… but I can’t so enjoy this music style! GREAT TVXQ always try a new different music style! 10. Love Bye Love : When I heard the intro I think I won’t like this song. The girl talks on the phone, It’s remind me to Stephanie’s voice in NEAR. Actually she is Go Ahra. I can’t understand because she speaks in korean. My favourite part is the Rap. Is it Junsu’s rapping? I think! JUNSU RAPPED!! Ohh… So long time never hear his rap again since Free Your Mind in last album Rising Sun. But this song still be my lowest rating in this album. I just hear the ballad over this album! 11. NAKWON [PARADISE] – OH’MY’GOAT!!!!!!!! This is a PARADISE SONG! I trust it is a slow R&B track! I LOVE this music style! I LOVE IT! LOVE IT! IT! Haaaaahhh….. Why does R&B always flow well on my ear? You’re all boys! You must try this song if you wanna apply for a girl! REALLY! The lyric tell that the boys describe their paradise feeling if the girls always inside them, they become so greedy to make the girl as their wife. NOT KIDDING! 12. AKNYEO [ARE YOU A GOOD GIRL?] – I don’t like this song! It’s like a style of house music remix (maybe called like that). Imagine if all their tracks are like this! Does it make sense? 13. FLOWER LADY – It’s just a Korean version of Dru – Stay With Me Always. From the title I can guess this is a nice romantic song! Yes! Allright! TVXQ sound so soft! My first impression for this one is same with You Are My Melody! JeJung’s ad-libbing n the end… it’s freaky! He said STAY WITH ME TONIGHT! 14. Don’t Say Good Bye : A classic title. I’m so boring with a title like ONLY YOU, Don’t Say Good Bye, My Girl, With U, My Love, I Believe and what else? Back to this song. It heard like a mellow song that released on 90s. Especially the chorus when Junsu or YooChun say “Don’ Say Good Bye”! It’s felt so old. And Uknow’s part “You’re My Love,You’re My Soul”… hyaaa I don’t know why I’m so greedy to Uknow’s voice now! But Junsu still the perfect singer for me! 15. FORGOTTEN SEASON – Jejung soloist in this song! Forgotten season is a hit song around 1980s! Yeah… Just properly I feel an old element! This Album configuration reminds me to SHINee World Album! JongHyun also did a soloist in near of last track! Hmmm,… we can’t judging them, they release the album in near date so we don’t know what’s the planning of Mr. SM! 16. LOVE IN THE ICE – Changmin-oppa wrote the lyric! A good translation over the Japanese version! The song is great too but I much prefer the Japanese version! I Love YooChun’s scream in the near of the end… He also do that in Picture of You! hahaaa Why Do I always crazy over for the freaking voice, dramatic screaming and R&B element?? It’s depend on me… Yeah Alright! It’s me .. I Love TVXQ! They’re great in everything! HWAITING!